Located on the sea, Aarhus blends a world city with a small-town feel. Home to a young population, the city has a reputation for producing internationally known pop and rock musicians. Nicknamed both City of Smiles and City of Cafes, Aarhus welcomes visitors to experience a relaxed pace, to indulge in the cafe culture, and to absorb historical architecture in the old town district. The city's many museums give visitors an insight into Danish history and the Vikings who settled the city. Aarhus is in East Jutland. 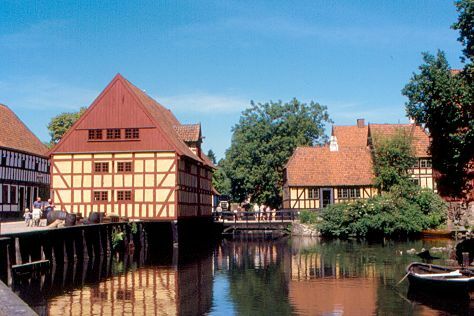 Our Denmark visit planning site allows you to schedule your trip to Aarhus, learn about its attractions, and find out about where else to go during your holiday. For a price, you can stay close to the main sights of this charming city at one of the many hotels located in Aarhus' historical old town. While it may feel like a romantic small town with its cobbled streets, accommodations here, especially centrally located options or hotels along the marina, are just as expensive as in many other Scandinavian cities. Moderately priced hotels and hostels are limited, so if you are traveling on a budget, book early at a spot outside the city center. For nature lovers passing through the city, there are also campgrounds located near Aarhus in the beautiful surrounding forests.